This fat little Christmas robin is full of character! His plump, hand knitted body is made from softest lambswool and finished with hand stitched detailing. Perched on your tree, with his spindly legs dangling down, he will add a traditional festive feel to any home. 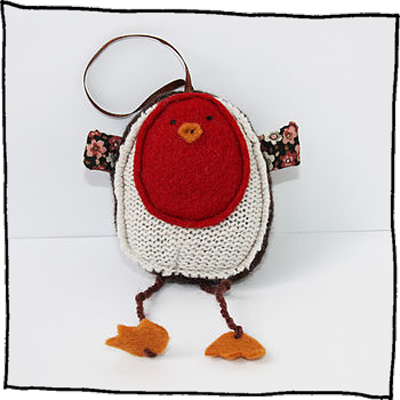 Individually hand made, each bird has vintage fabric wings and are beautifully gift-wrapped in a fabric bag. Your Robin can be personalised with up to two initials of your choice hand stitched in white onto his red tummy. Use the box below to let us know your initials.